In response to the need of a brand for which to ride, one of the earliest Alpha Testing, Inc. logos made its appearance in the DFW market in the mid 1980’s. And did it look like an actual cattle brand, one that could have been done with a running iron! Today, I see that strong engineering influence – straight lines and single color. Stayed tuned for snapshots of the evolution of the Alpha Testing, Inc. logo. If you have examples of older logos of our contemporaries, send them to Jeff Wilt. Note: I first heard of that cowboy saying when reading about the King Ranch. The story of that ranch is rich with Texas history, and the ranch is worth a visit when in south Texas. 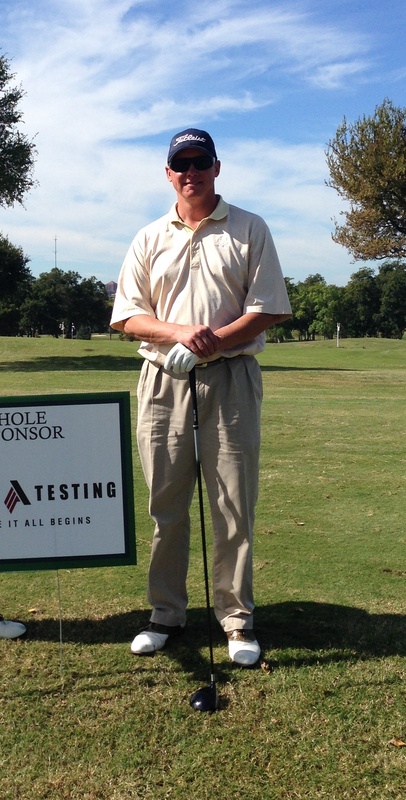 Supporting our local schools, our clients that work in the K12 market, and taking full advantage of a hall pass from the department head, Blaine Lehman and Andrew Adams, EIT played for Team Alpha in the 2013 CEFPI North Texas Chapter Annual Golf Tournament on October 24. Lehman has a long history with, and respect for, the game of golf (translate that to he is DANG good). Part of the Alpha Family since 2012, he is attending the University of Arlington (UTA) pursuing his Bachelor of Science in Civil Engineering. 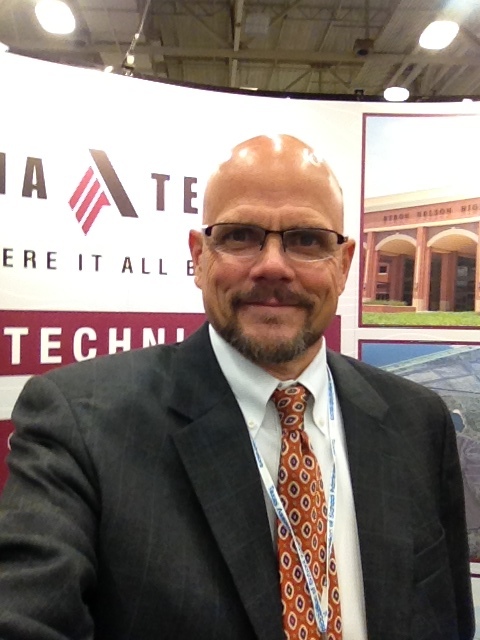 Adams joined Alpha in 2011, and will complete course work for his Masters of Science in Geotechnical Engineering at UTA in December 2013. The CEFPI tournament was Andrew’s first scramble, and we hope it was the beginning of something big on the links. 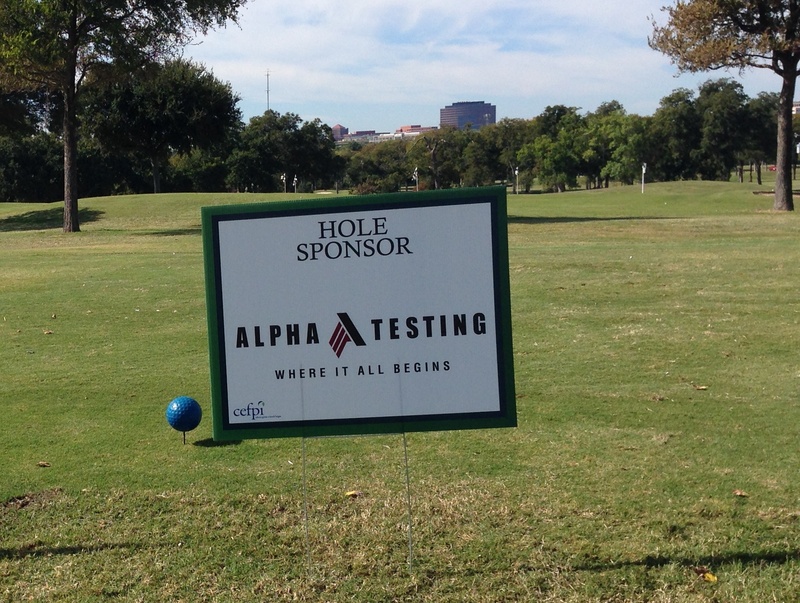 Alpha has sponsored the local Council of Education Facility Planners International (CEFPI) golf tournament many times. In 2013, Alpha was a hole sponsor, garnering us event advertising. We entered a 4-man team, and provided two hole-sponsorships. In addition, we provided water bottles for the event – some 10 cases. The bottles were labeled with the Alpha Testing, Inc. logo, and were handed out around the course. Alpha also participates in the CEFPI Southern Region Conference annually. Artist, antique collector, lover of shoes and our new Business Development employee. 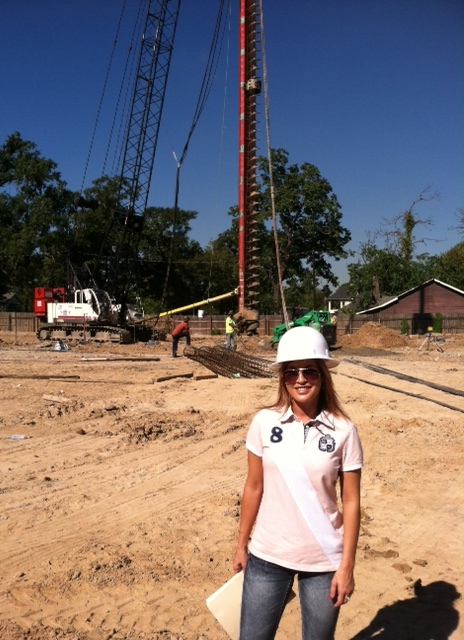 Lindsey Blake joined the Alpha team in our Houston office, and is now sporting her engineering shoes. As a welcome aboard, the team provided Lindsey some on the job training, giving her a hands on look at auger cast pile installation. Lindsey enjoys canoeing on the San Jacinto river and going to the beach with her fiancé and his kids. If you see her with binoculars, she’s probably looking for Neptune! Welcome Lindsey! And we are out to prove it. 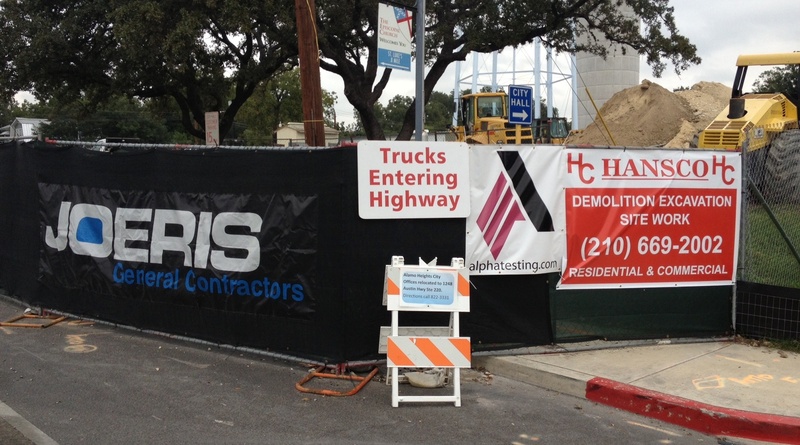 San Antonio has taken the lead in displaying the new Alpha job site banners for 2014. Initial shipments of the banners have been sent to San Antonio and Houston. Fort Worth is next, with a re-order scheduled for Dallas next week. Our goal in 2014 is to have that sign on as many high profile, high traffic job sites as possible. Simple, visible from the street (and at speed), and clear, we work the name in –for those that need it– by including the website address. At the Alamo Heights Municipal complex (above) we get our point across, and give a viewer a reason to go to our website. I have a slightly different view on most exhibit opportunities, often associated with conventions, professional meetings, or actual trade show events. My goals, approach, expectations, and what I consider winning results are different – as I am selling professional services and not a commodity. Ours is not the world of pre-event selling, hosted dinners, hard selling in the aisle or booth to booth, or blanket email follow up after the event. The primary goal for a professional services firm that has set up an exhibit booth is simple presence. Some might say we are third tier in the consultant chain, in that we work for attendees (end users) as well as other exhibitors (consultants) at any event we attend. Our goal is to be seen as a constant presence in, and part of, ‘their’ world. If you have sufficient staff in the booth, one can stand back and watch as attendees pause and comment to others “we used these guys”, or “I relied on them for my last construction project”. That is word of mouth referral, and it is priceless! Those referrals are generated simply be being present. Our approach to manning the booth is to continue to be a resource to current and future clients. We are geared to answer questions for other vendors, as well as those that do approach us with specific needs. If one is to be a resource, you need to look the part. Booth staff needs to be welcoming, smiling, and not engrossed in a conversation with coworkers. Professional dress and demeanor, plus an inviting stance open the door. Success is defined when a client brings another attendee by to answer a need, or to explain a process. Expectations are met when staff has connected, or reconnected, with attendees and other vendors. These events are a chance to network, interact, and share with our peers within the profession – either consultants or owners – in a relaxed atmosphere. When we can get technical staff to attend, our client base has the opportunity to meet the man behind the signature, the man behind the phone voice – to meet the expert. My primary expectation is that we deepen relationships. Sure, we take notes, we swap leads and general information. And we follow up on those as well. No matter the level of typical sales activity, we define success if we get one chance to be an active resource, if we get one engineer in front of one new client, if we reconnect with one person, and if we get one thank you for supporting the event. 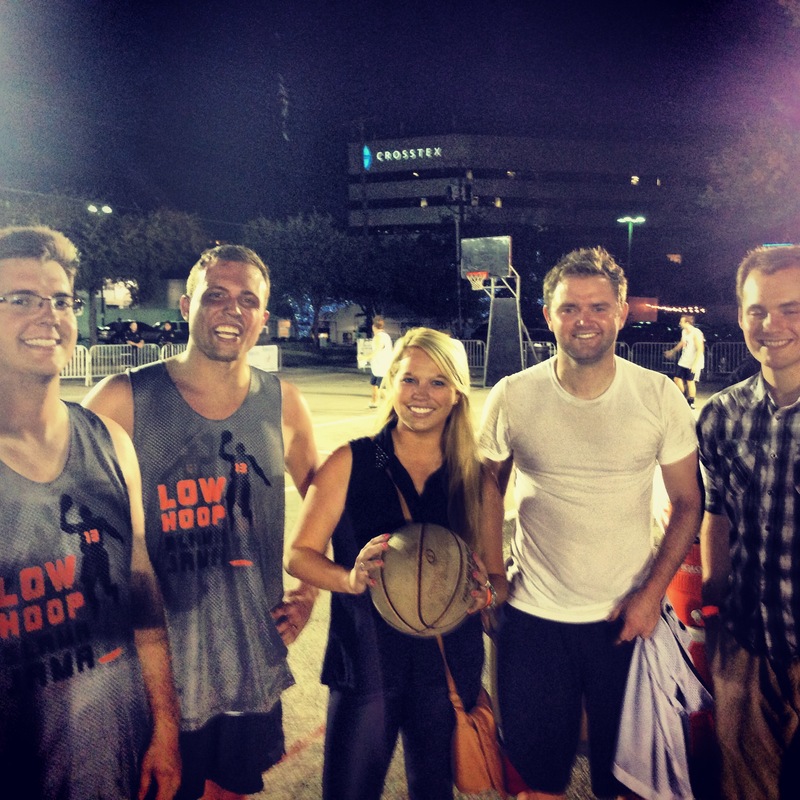 The competition included teams from Billingsley Company, F.A. Peinado, Hunt Realty, National Development Council, Good Fulton and Farrell, CBRE, Pacheco Koch, NorthMarq, Perkins + Will, Jones Lang Lasalle, The Retail Connection, Brandt Companies, MacFarlan Capital, Chief Partners, Goldman Sachs, Forge Real Estate Partners, Phoenix Capital, Cushman & Wakefield, Berkley Capital and Jim Lake Inc., Realtors. Big thank you to North Texas Commercial Association of Realtors and Commercial Real Estate Development Association, North Texas Chapter for hosting this event! We also want to thank our team: Ben Njaria, Jacob Wadlington, Andrew Ramler, Griffin Kane and Robert Boone!